I pulled the battery pack out and looked at it a little bit closer. Basically all that is there is 3 AA NICD rechargeable batteries in series and put into a cute little package. So, here it is, my Do It Yourself (DIY) portable / cordless phone battery pack! 1) First I got some of my NIMH batteries that are 1800 mAh (compare this to the 700 mAh NICD batteries that came with the phone. In theory I should get about twice as much talk time. $3.00, is about the price of this pack because Fry’s Electronics has similar NIMH batteries (2000 mAh) on sale at 10 for $10. 2) Next I used a hot glue gun to stick the batteries together (next time I’ll use some JB Weld 4 minute epoxy. 3) I cut out some small strips of copper and placed them in the same position that the contacts on the original battery pack and glued them into place. 4) I used some sandpaper to scuff the contacts on the battery terminals and soldered the wires to the contacts. This put all the batteries in series at 3.6 volts. Like I said, it isn’t pretty but it works great! JB Weld Epoxy to stick the batteries together. Shrink wrap to make the whole thing really pretty.Another option is to pull the original pack apart and use it as my case for the batteries. Nickel Cadmium (NICD) take an “overcharge” better than Nickel Metal Hydride (NIMH). Portable phone chargers are “dumb chargers” because they don’t sense when a battery is fully charged and keep charging at the same rate. People say that this is okay for NICD, but bad for NIMH and will damage the batteries. Others argue that because of the higher capacity on the NIMH that overcharging isn’t an issue. To be on the safe side I’m going to try to remember not to let the phone stay in the charger for days in a row. Before doing this cordless phone battery modification I put 3 AA NIMH batteries in a battery clip to see if the NIMH batteries I had would work. I hooked the wires from my battery clip to the phone and it wouldn’t turn on… it would just beep three times! I couldn’t figure it out. The voltage was the same as the original battery pack.I put the original pack back in and hit the on button, but the same thing happened. At first I thought I broke something, but then I had an idea. I took the phone and put it in the charger and pulled it out. The phone worked fine! From this I discovered there is something about the phone that requires that I “reset” it in the base before it will work properly. to do this, i’d do a “repack”. i’d use the original case, which probably also contains some safety bits and nicer contacts, but ends up being a much neater solution. the batteries are probably fine being on the charger all the time. feel them and you’ll be able to tell if they’re being overcharged, by the temperature. they shoudl be warm when charging normally, but they’ll feel hot when being overcharged. Followed the procedure as it was described and it came out perfect. Using the hot glue gun and being careful taking apart the old battery pack is key to making it easy.I used some AA batts out of some solar lights. Excellant post and thanks. 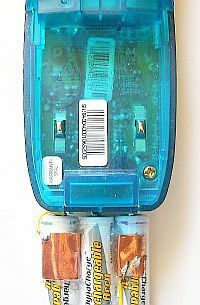 Different phones often have different connectors on these battery packs, but it’s always the same idea – three 1.2 V batteries connected in series. I’ll give some advice for people like me who don’t have some of the tools mentioned – a glue gun or a soldering iron. For my GE phone, I put three new AA NiMH batteries into the phone by themselves. I then fashioned a few slabs of aluminum foil in the desired shape and thickness, then wedged those slabs between the ends of the batteries and the phone case to connect the middle – ends to the middle + ends in the series. These slabs also serve to put some compression on the batteries so they stay put in the case. My original battery pack simply had a wire soldered onto the + end, and another wire soldered onto the – end. I ripped off this original wiring to re-use it. With enough compression holding the batteries in the phone case, I simply slipped the terminal ends of the wires in the + and – spots of the series. When all was said and done, I plugged the battery pack in, closed the case, and it made for quite a tight fit. 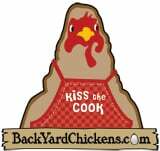 It works like a charm and is good for us people who are handy and clever but don’t have tools around. 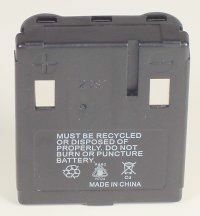 I will also mention that when you start connecting these batteries together, it is normal for them to get warm. The batteries might be at different voltages and the warmth is just some current flowing between the batteries to even out the voltages. If they are HOT on the other hand, that’s abnormal. Make sure any aluminum slabs are only touching the batteries they are supposed to be touching, or you could get a short circuit somewhere, which will cause hot or damaged batteries. I love anything to do with phones, whether its mobiles, cordless phones. I especially love the technology and weird stories. Good post, thanks. I am sure that your DIY battery packs would do the trick but to solder a battery is not very clever as battery cells have delicate safety vents that can be damaged and your battery is not going to last very long or could be damaged beyond repair.Welding is the only way you should connect battery cells together.  A charger for nickel-metal-hydride can also accommodate nickel-cadmium, but not the other way around. A charger designed for nickel-cadmium would overcharge the nickel-metal-hydride battery. Jan, some great points you have there! If I were doing this again (I think this post is about 4 years old now) I’d use the tabbed batteries that come ready to be soldered and would use either NICD. Do you think it would be possible to use NIMH with a really high mA hour rating, especially given self discharge, etc? Came across this website by chance and thought I should advice.Dont even know the country.I live in New Zealand.To answer your question; you can use any “mah” you like but you can not use a nimh rechargeable battery and have it charged by a charger dedicated for a nicad. By the way, I make battery packs as a supplement income.Designed my own “micro welder” and a very clever friend did the electronics for me. Soldering to a battery can overheat the battery, and I have had difficulty getting a good bond. Without sourcing tabbed batteries– but using locally available rechargeable, what are options to attach a conductor between the battery terminals. Someone mentioned ‘welding’. What is this in this small of space… and does it help the heat damage issue? I solder batteries for my panasonic shaver. 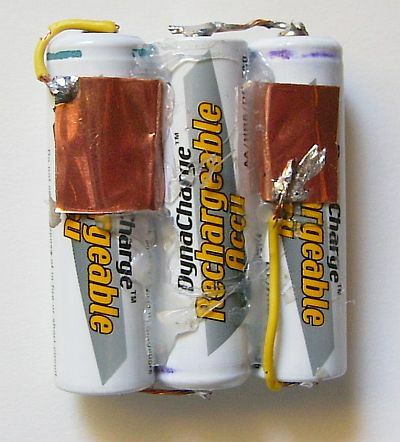 I’m going to do it for my phone, but some ideas: I’m going to try duct tape 3 batteries together (though I have a glue gun). Also the source sells batteries holders but they may be too bulky. My idea is to make a replaceble battery holder so that the next time the new batteries die, I can replace them without too much work. The aluminium foil sounds good, but I would be very caution not to have hot wired batteries because burning a house down while you are away is not good. Update: I finished making 2 battery packs. 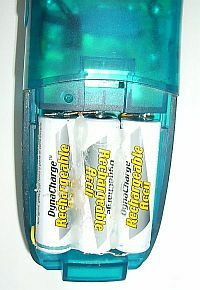 The last one I left the original plastic wrapper on the batteries, took 2 out and left the other 2 in, then duct tape 3 together which holds better, then cut holds at +/- ends of the plastic wrap. I’ve made battery packs for my uniden tru-8885 handsets.. I’ve just ordered more aaa batteries to make the 3rd handset pack. although 2 handsets is more than enough for right now, hehe.. When working with delecate parts & soldering it’s very easy to get burned. I wish a “aaa” pack would fit in the same space, that way you could just swap the batteries at will instead of soldering all the time– but they make the form factor of the phones to be very anti-battery pack… maybe it might fit if I can find a thin pack & scrape away most or all of that foam that locks in the pack to keep it from scrunching around. Very nice and informative . Recently the battery pack ( Panasonic, 3.6 volts, 650 mAh,) of my cordless failed to recharge I placed it in a ziploc and kept in the freezer for abt 16 hours. After allowing it in the room, to bring it to room temperature I placed it in the phone, recaharged ant started working. This battery pack gave me a service for abt 4 years! Now it is working again!.